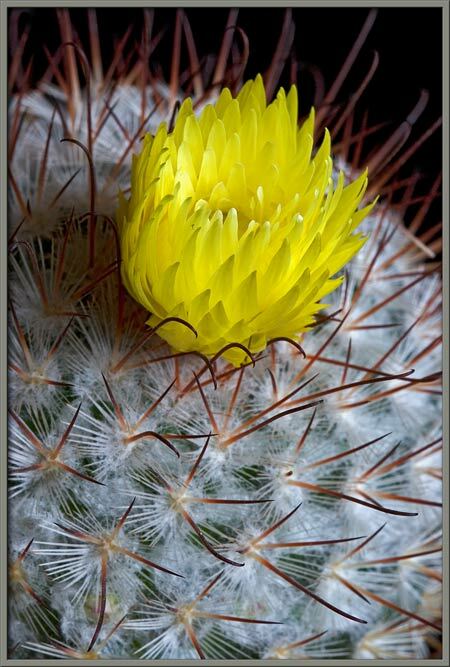 Since most cacti grow in hot dry regions, they have developed many unique strategies to enhance their chances for survival under inhospitable conditions. 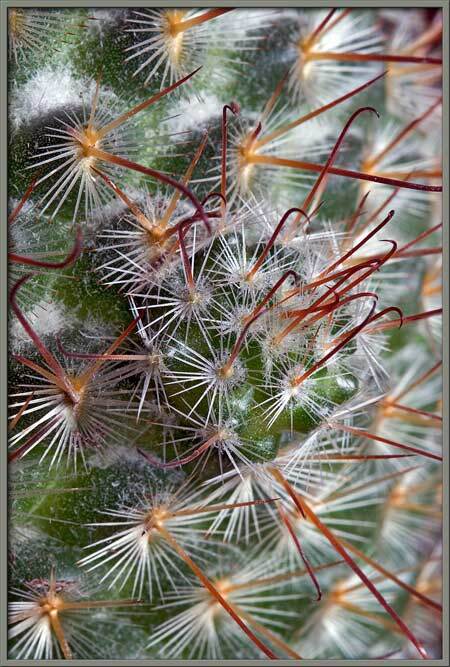 Cacti are succulents (succus “juicy” - lentos “leaf”) and store water in their stems. The most basic of these survival adaptations is the plant’s shape. In order to minimize water loss from the surface, the ideal shape is a sphere which has the lowest surface area for a given volume. 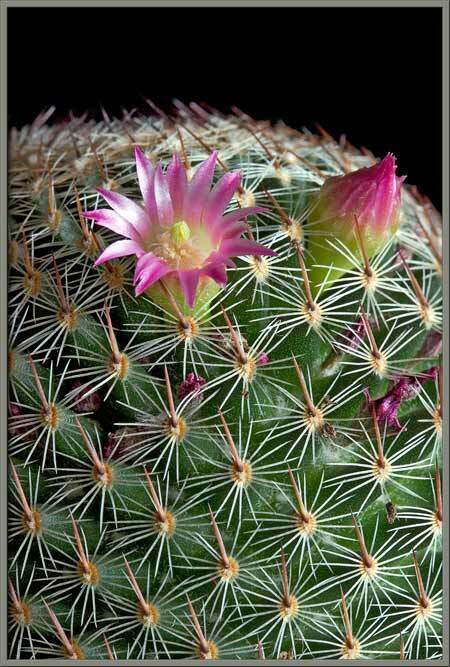 Most cacti are reasonably close to this ideal, with spherical, barrel-like or candle-like forms commonly being observed. A second important survival strategy is the development of an intimidating defense shield against grazers, formed by an array of spines. More adaptations will be discussed later in the article. 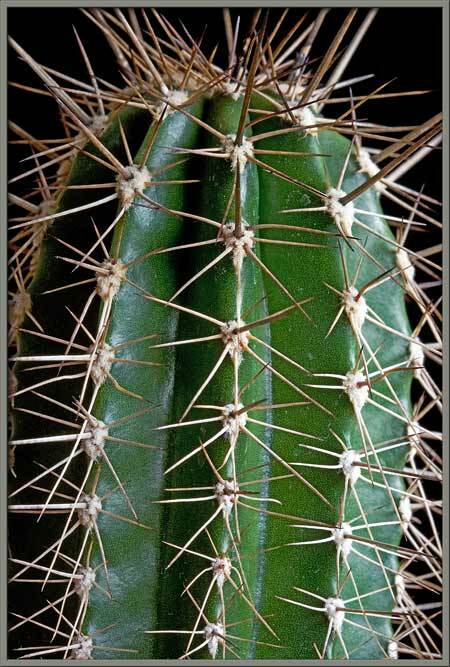 As can be seen in the image above and the two that follow, the surface of the cactus is covered in a variety of spines. 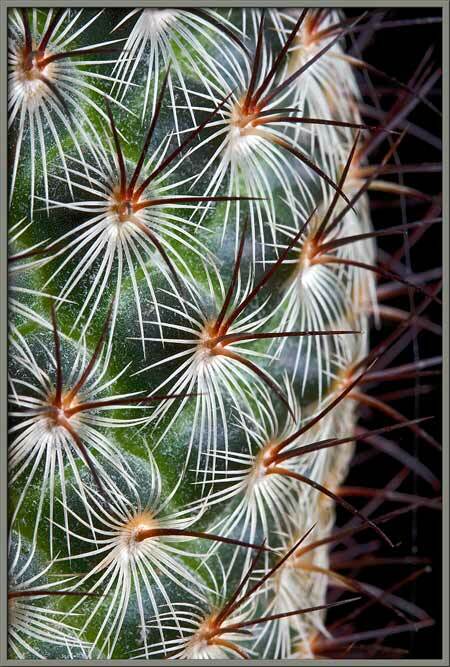 Each group of spines grows from a bump on the surface called a tubercle. 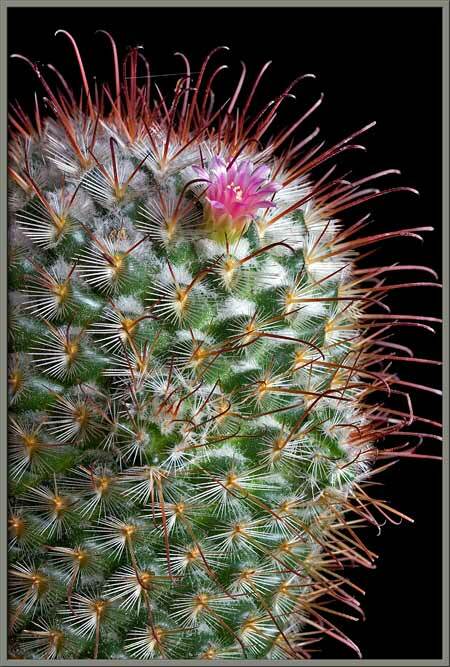 Each tubercle bears an areole, a patch of tissue from which spines are propagated. 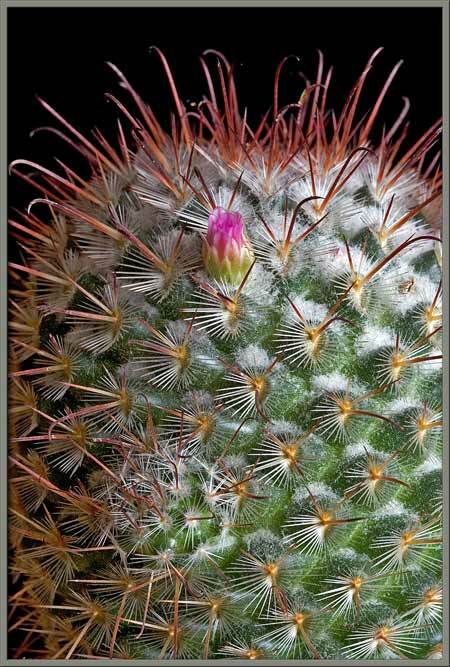 (Areoles are found only in cacti.) 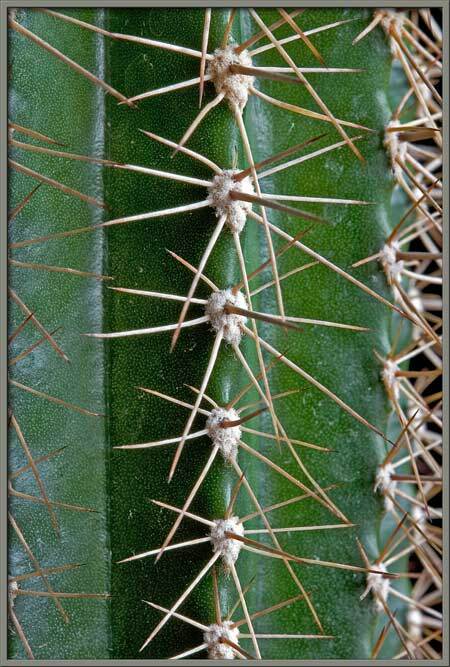 These spines protect the plant from predators, but they also help channel water condensed from cool night air down the stem to the plant’s roots. 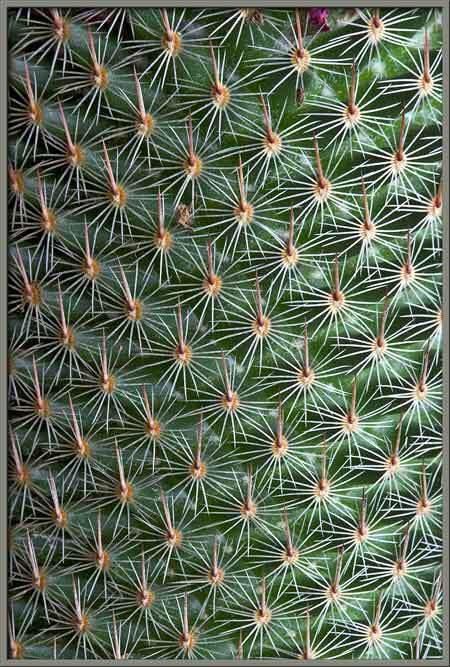 If you look closely at the first image, two groups of spines are visible. 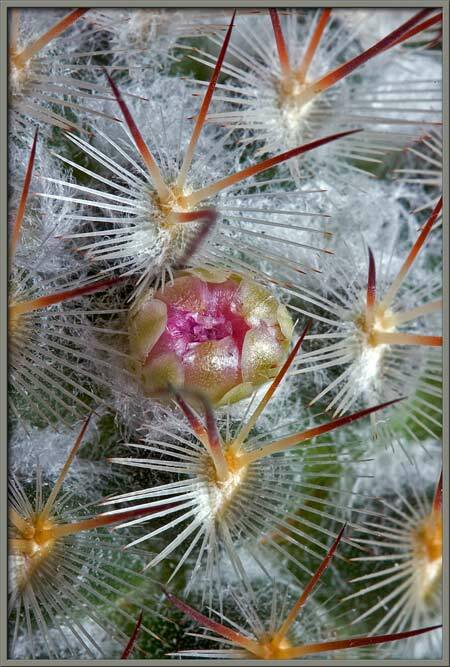 Three red brown spines project out from the surface at the centre of the areole. One of these spines is longer, and has a hook shaped tip. The two remaining shorter spines are perfectly straight. These three spines are referred to as the “central group”. Closer to the plant’s surface is the “radial group”. 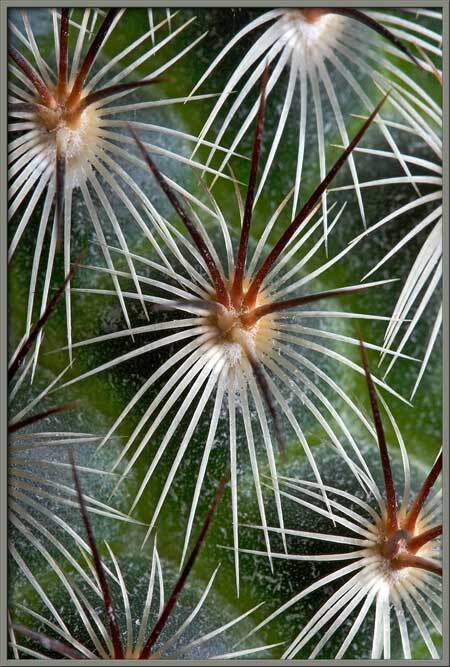 These flexible white spines grow radially around the circumference of the areole apex. 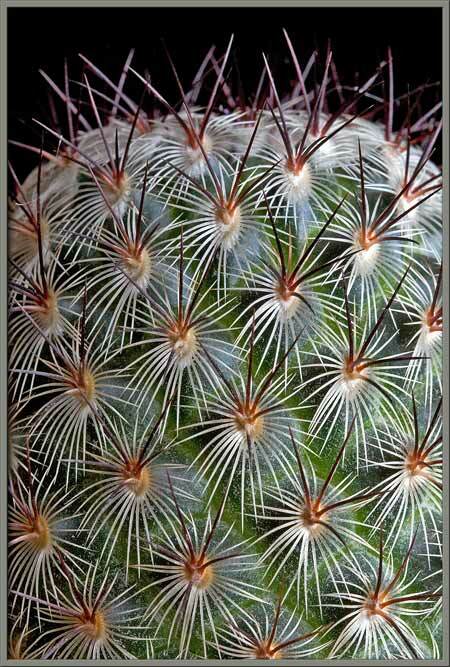 The white colour of the radial spines is thought to partially protect the plant’s surface from the sun’s ultra-violet radiation. 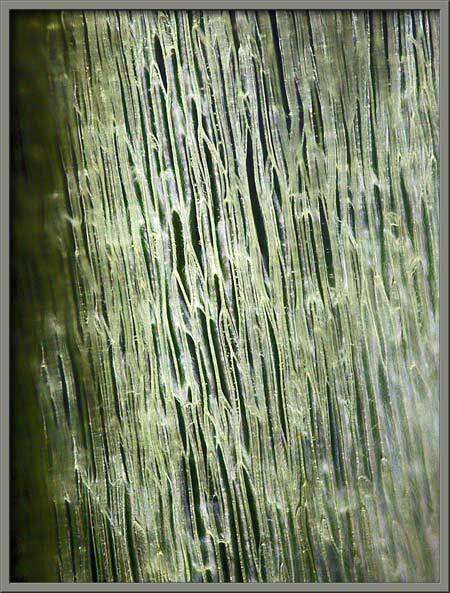 Under the microscope, the curved tip of the long central group spine is seen to be unpleasantly sharp. 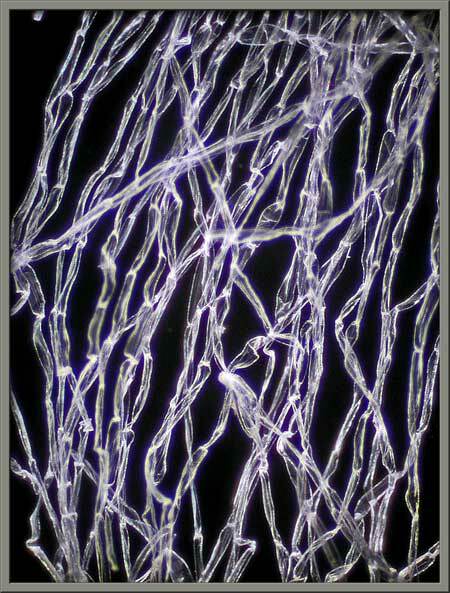 The higher magnification image at right shows the cellular structure of the same spine. 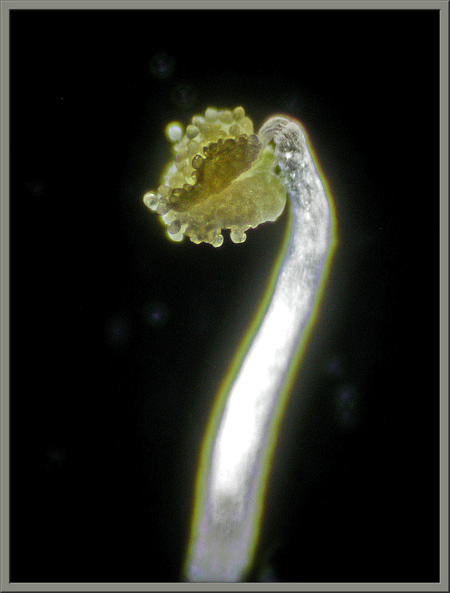 Tiny, irregularly shaped protuberances cover the surface. 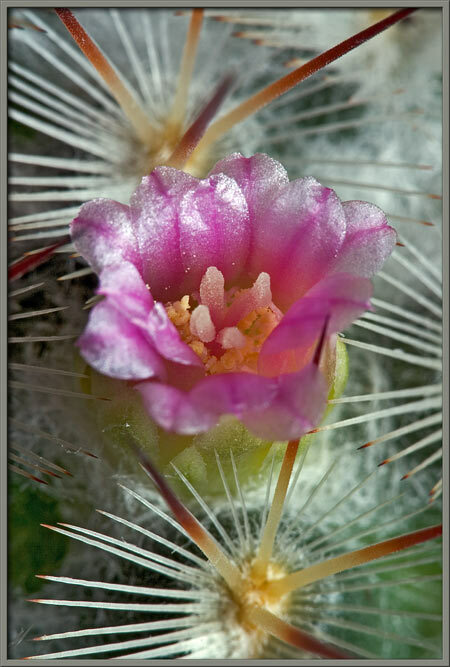 Notice in the two images that follow, the many rings of white radial group spines that cover the plant’s surface. 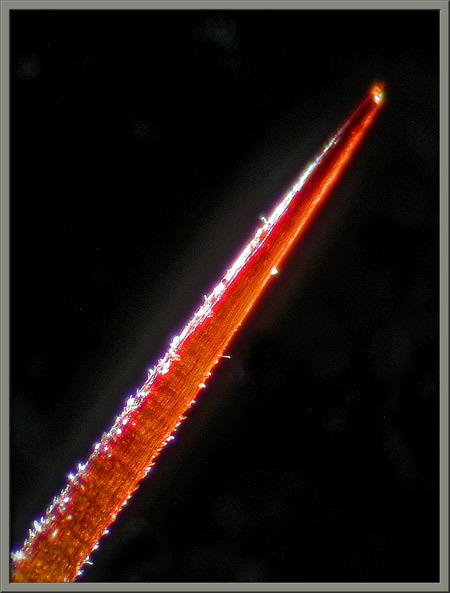 The photomicrograph below shows the red tips of several of the white radial spines. These too are extremely sharp, although it is unlikely that they contribute to the defense against grazers. 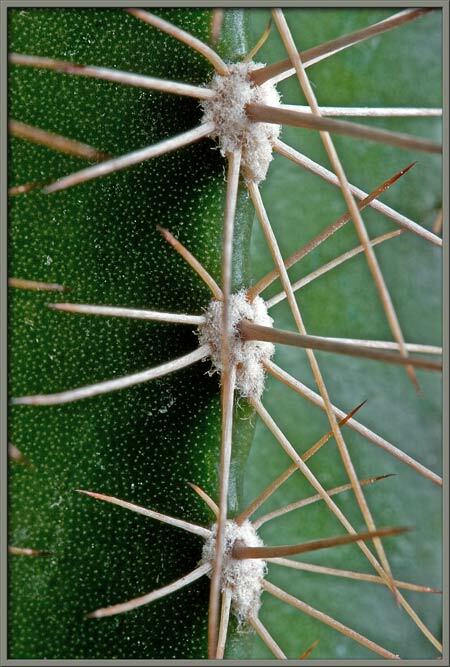 The bases of the radial spines are shown at their points of attachment to the areole. The image on the right shows the bulbous bases of the central group spines. Careful inspection reveals four central spines instead of the three expected. Surprise! Although there is always just one hooked spine, there may be two (usually), or three (unusually) straight central spines connected to each areole. 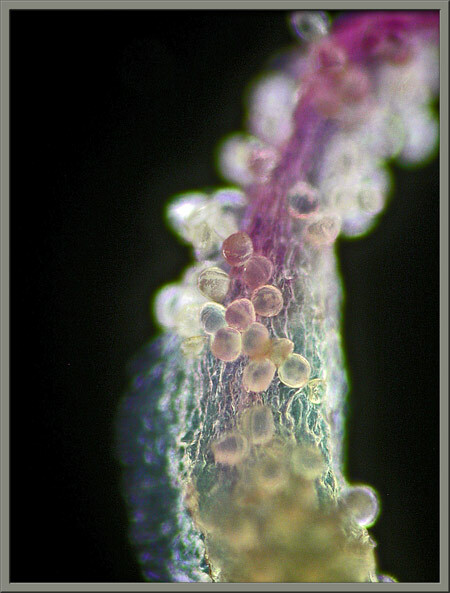 Occasionally a large tissue growth appears on the surface of the stem. 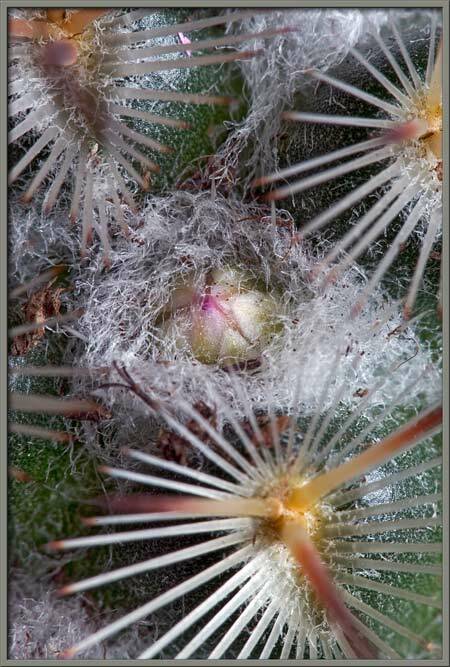 (The plant photographed here had two such growths.) 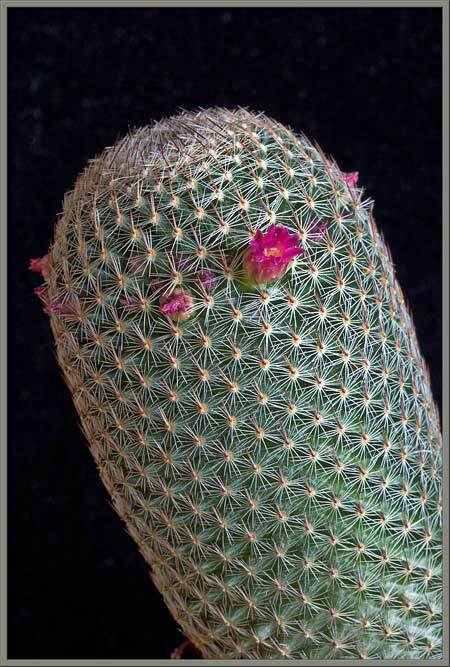 The arrangement of areoles on the surface of the bump appears to be less regular than on the rest of the stem. 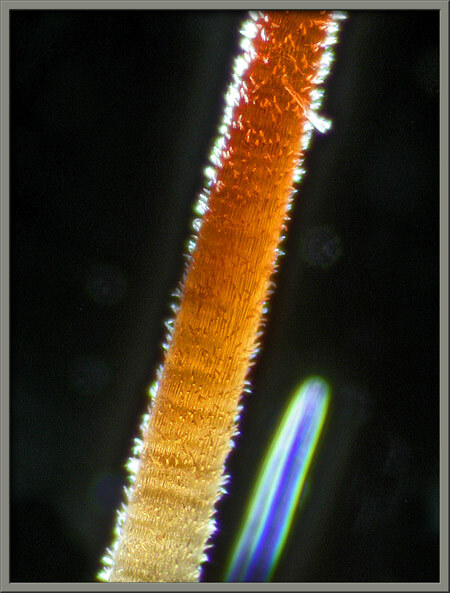 A photomicrograph of one of the straight central spines can be seen below right. 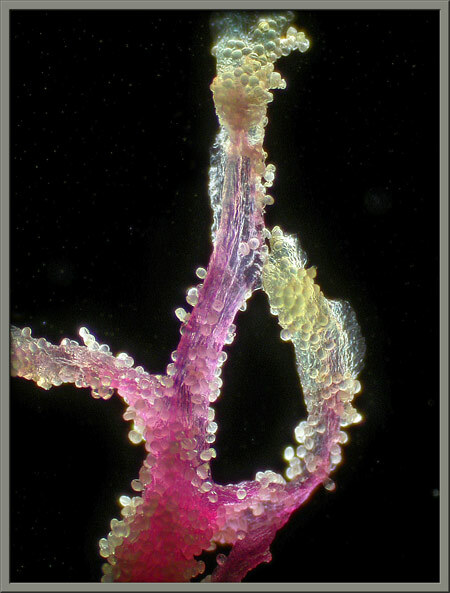 These central spines form the lethal looking barrier preventing contact with the surface of the plant (left image). 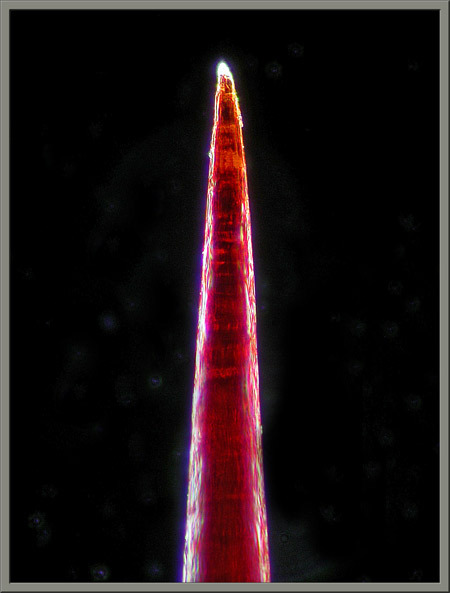 Higher magnification images of the tip and body of one of the spines can be seen below. 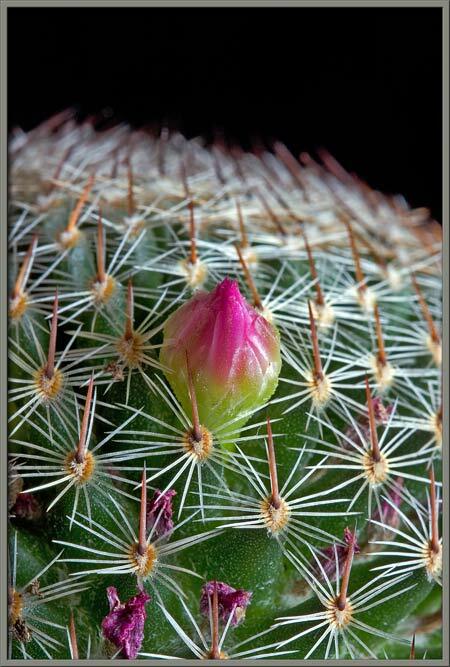 The bud stage of an areole can develop into a flower if conditions are right. 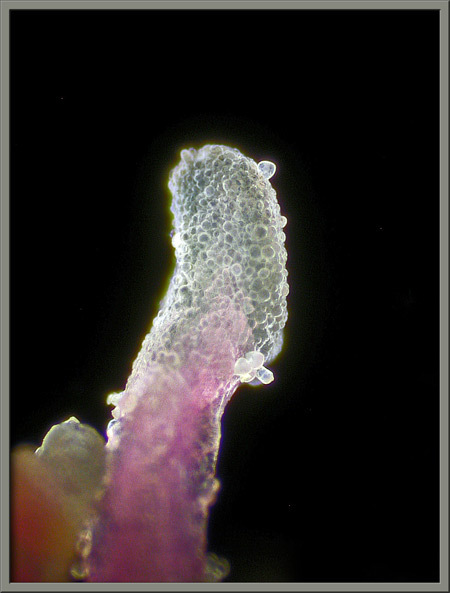 In the images below, the tip of a flower bud can be seen pushing up through the dense mat of fibrous threads which covers the areole. 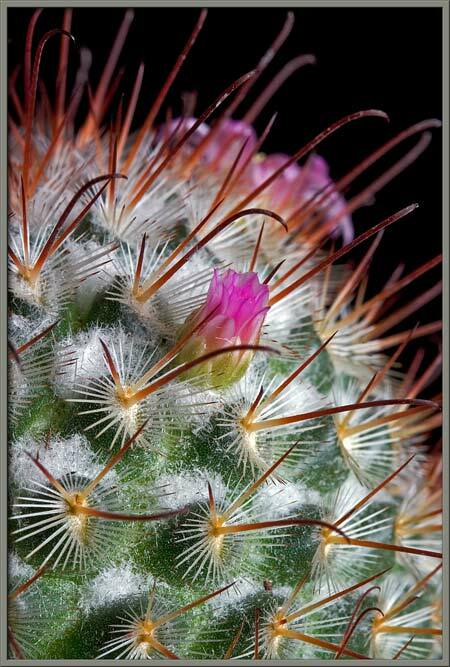 These fine white fibers are concentrated both around areoles, and in the depressions between areoles, but only near the top of the cactus. 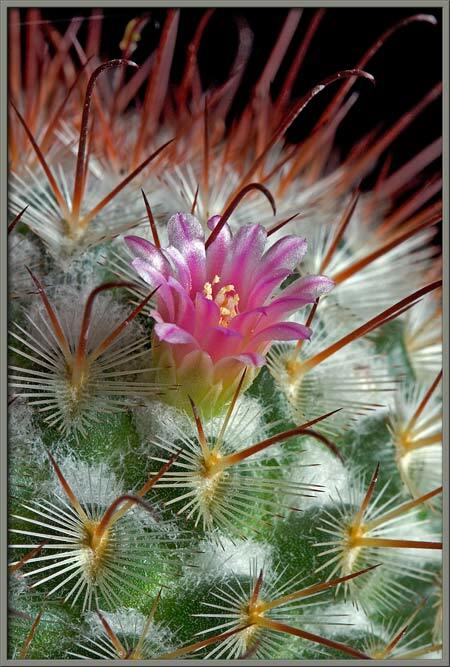 With the UV light from the noon-day sun being the most dangerous, this is where the cactus needs the most protection. 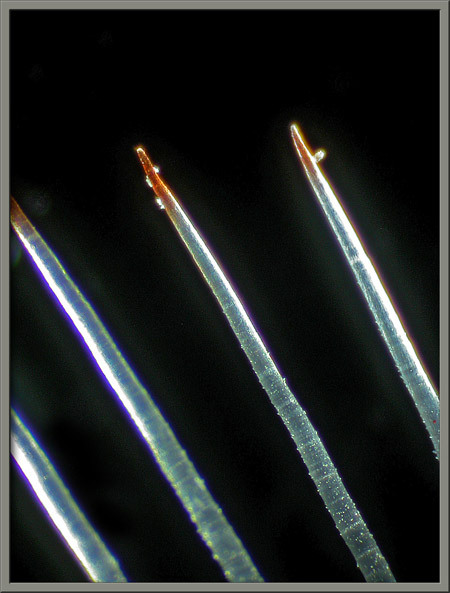 Photomicrographs of these matted fibers using dark-ground (first two), and phase contrast (last) illumination can be seen below. 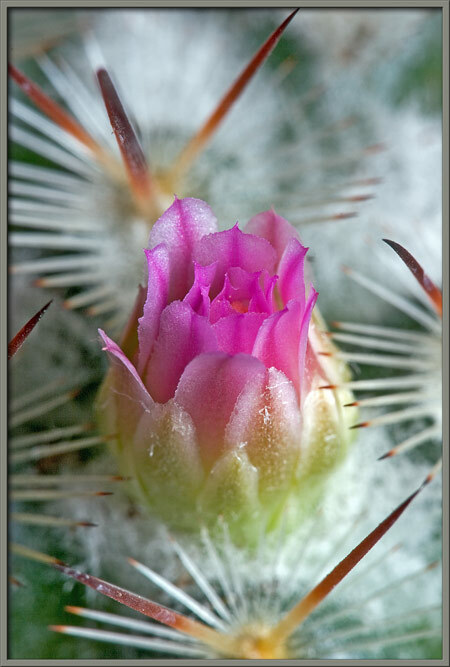 Several days after the flower bud has first pushed up through the matted fibers, the pink petals and surrounding greenish-yellow bracts (modified leaves) become visible. The image on the right shows an atypical formation. Both images show central groups containing three spines and others containing four spines. Later the petals elongate and begin to open. The flowers are particularly striking at this stage. 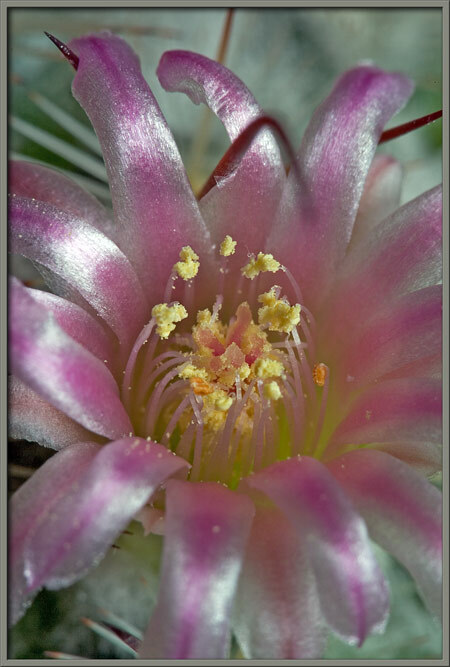 Eventually the reproductive structures at the centre of the flower become visible. Each petal is pale pink, and has a dark pinkish-red band up the middle. Four white stigmas are positioned in the middle of the flower. 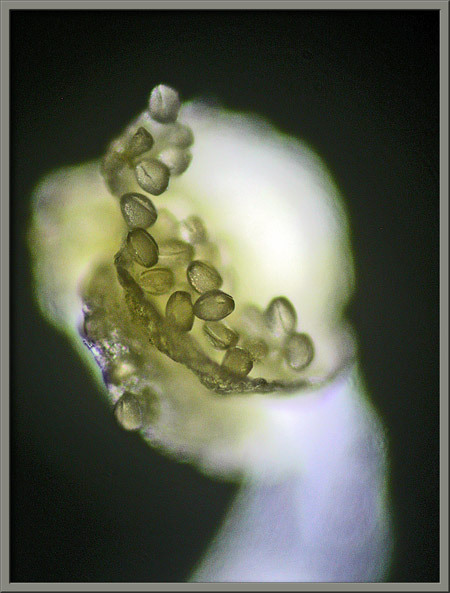 Under the microscope, the stigma (female pollen accepting organ) appears to be composed of a number of spherical white cells. The supporting red style is also visible. 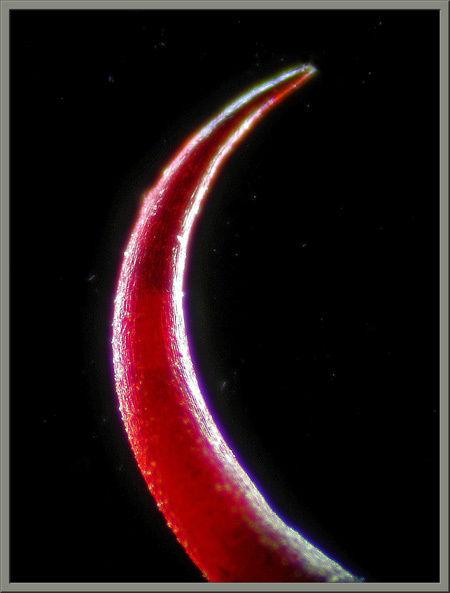 Several pollen grains cling to the stigma and style. 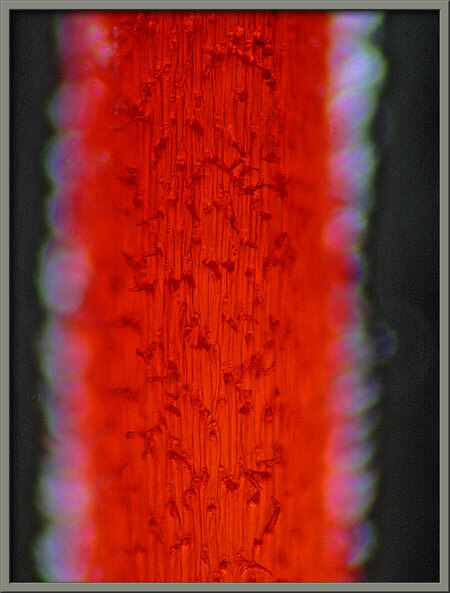 A lower magnification photomicrograph shows some of the stigma (white) – style (red) lobes that compose the pistil. 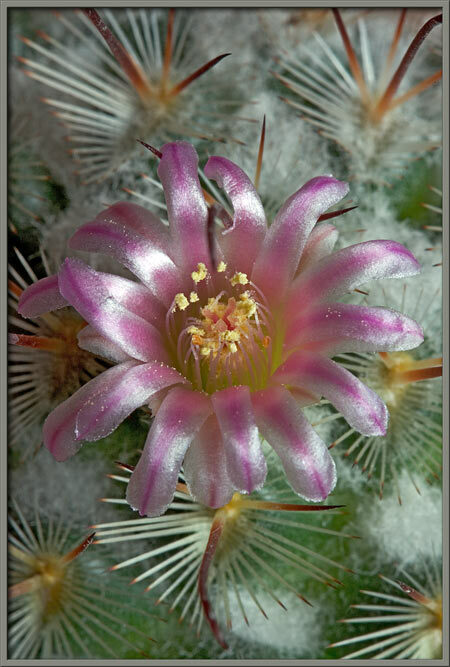 All surfaces are coated with pollen grains. 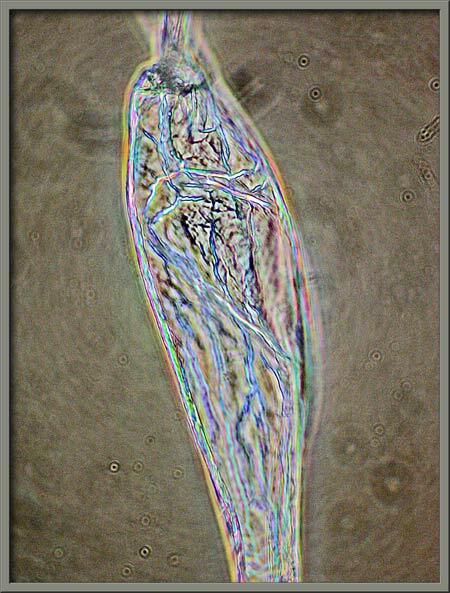 Higher magnification of a segment of style reveals the shape of the pollen grains – ellipsoidal with a longitudinal groove. 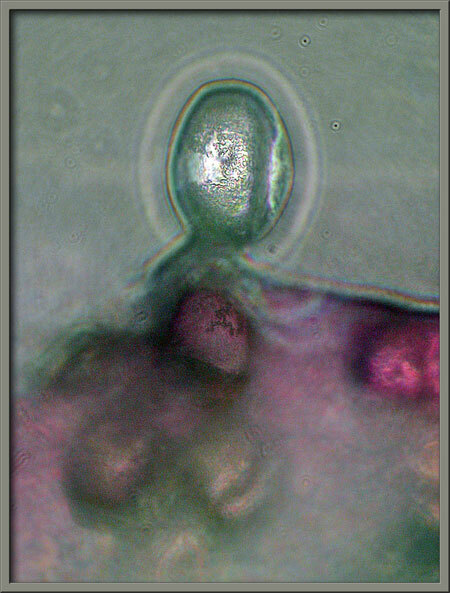 A much higher magnification phase-contrast photomicrograph shows the rough surface of a pollen grain. The mature flower has both sepals and petals, but they are indistinguishable. 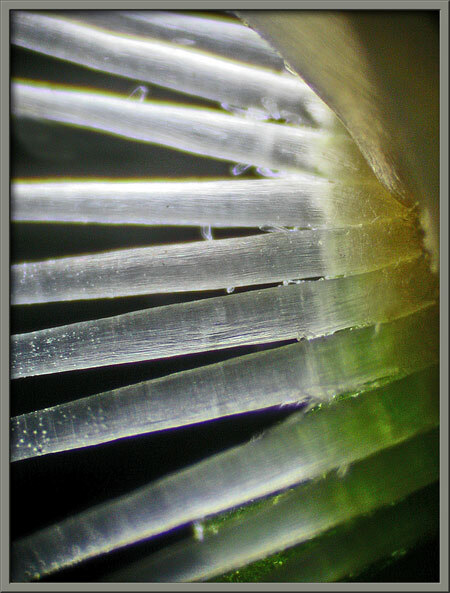 At this magnification you can see a large number of stamens overhanging the central stigma lobes. 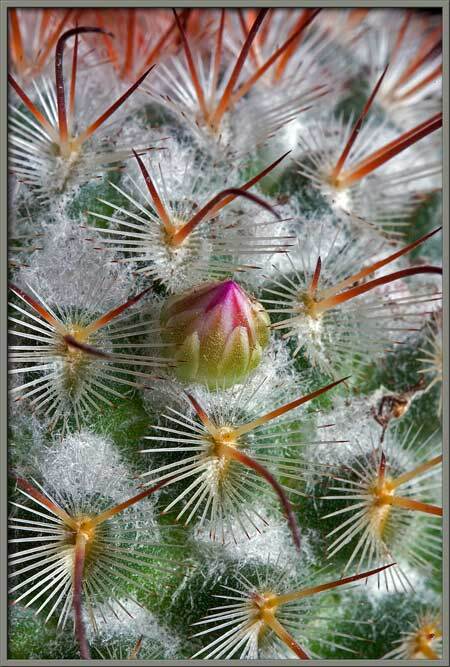 Notice in the close-up below, that some of the petals have a pointed hook at their tips. 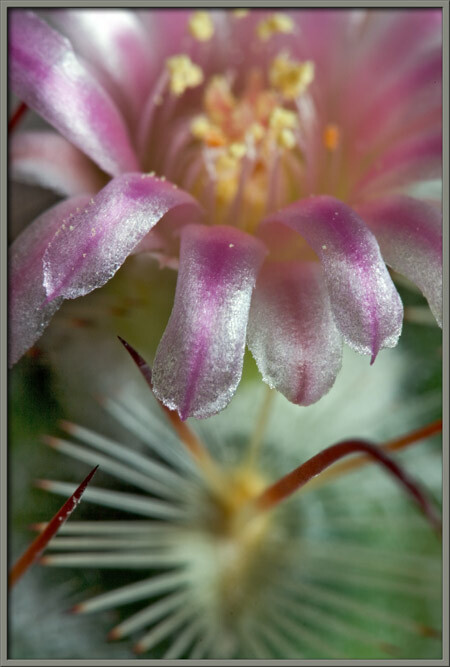 The photograph below shows the ring of anthers (male pollen producing organs) and supporting filaments. Although it appears as though self-fertilization is likely, this is not the case. 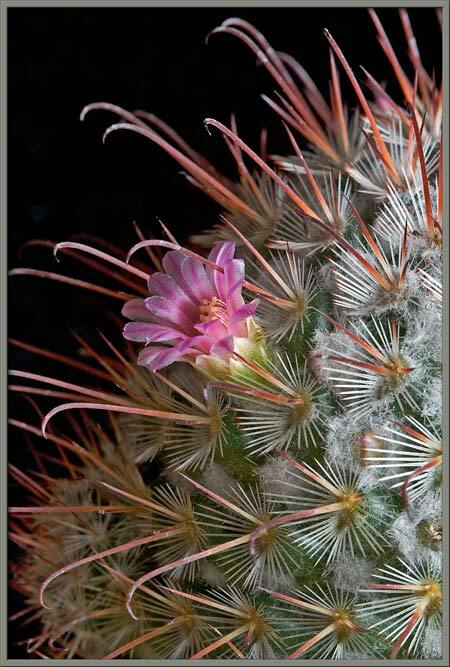 Most cacti are protandrous, meaning that the anthers shed their pollen before the stigma’s surface is receptive. 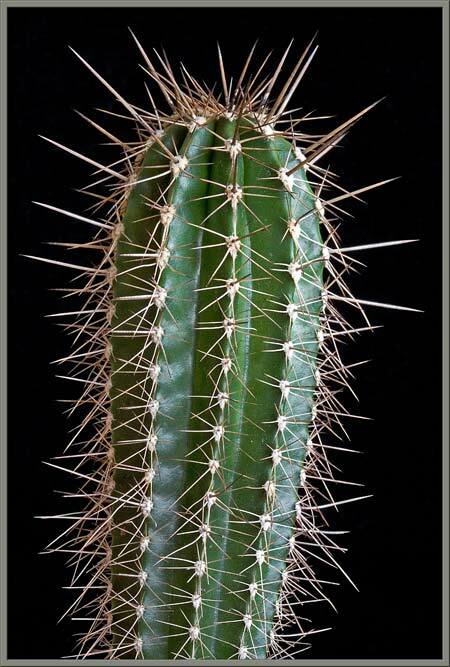 Also, cacti are usually self-sterile. It is therefore left for visiting insects to transfer the pollen from a different plant, thus ensuring cross-pollination. 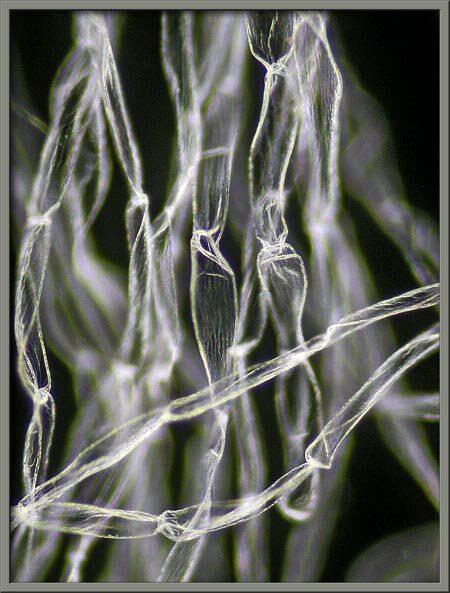 Photomicrographs of the anther, and supporting filament can be seen below. 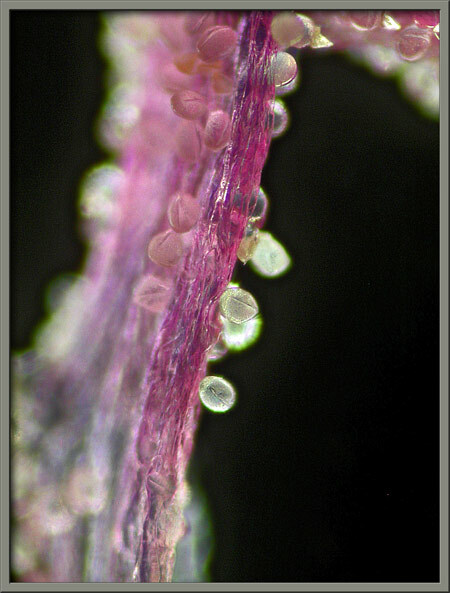 A higher magnification view of several filaments shows their cellular structure, and the many pollen grains adhering to their surfaces. 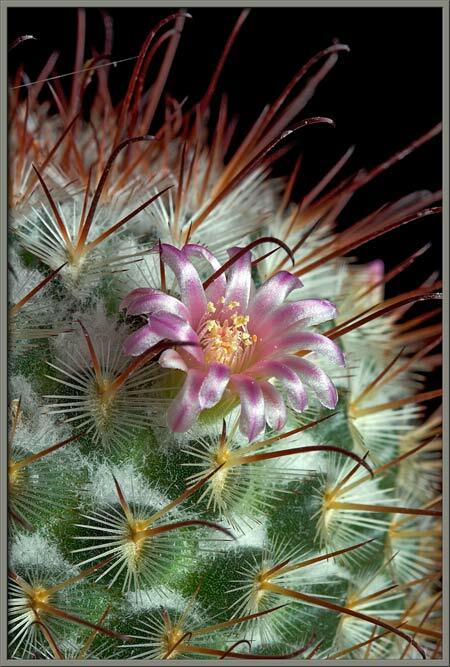 The retailing of cactus plants is an interesting phenomenon. 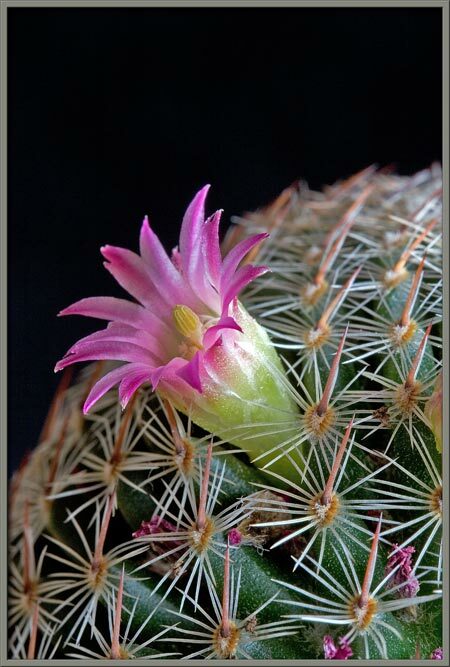 What strange species has small pink flowers, and a single large yellow flower at its top? In reality, no such species exists! 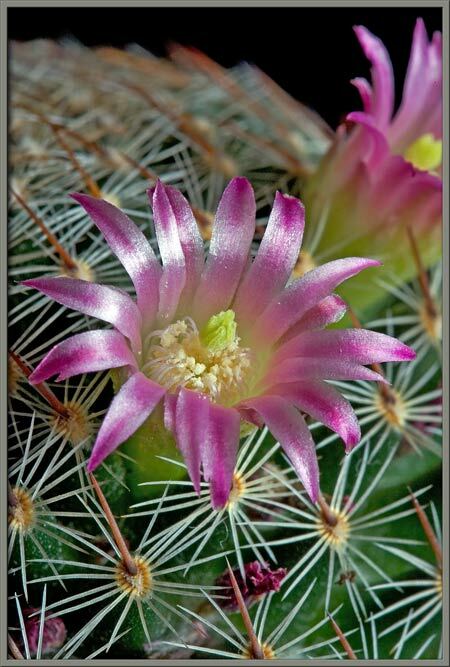 The greenhouse managers have decided that “we” the buyers want our cacti to be colourful all of the time, not just when they are in bloom. 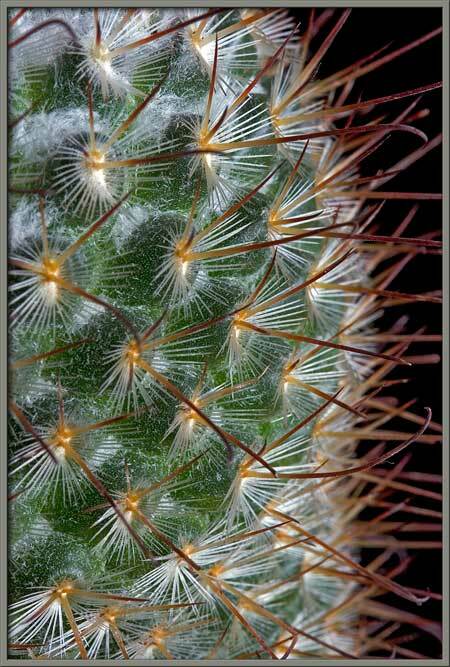 They therefore glue the dead flower of an entirely different plant (- not a cactus!!!) 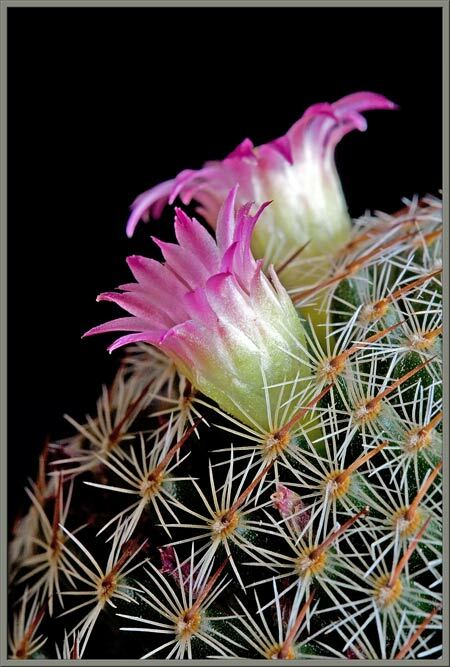 to the top of each cactus they sell in order to increase its visual appeal. The mind boggles! Out of curiosity, I photographed the cellular structure of a dried strawflower petal. 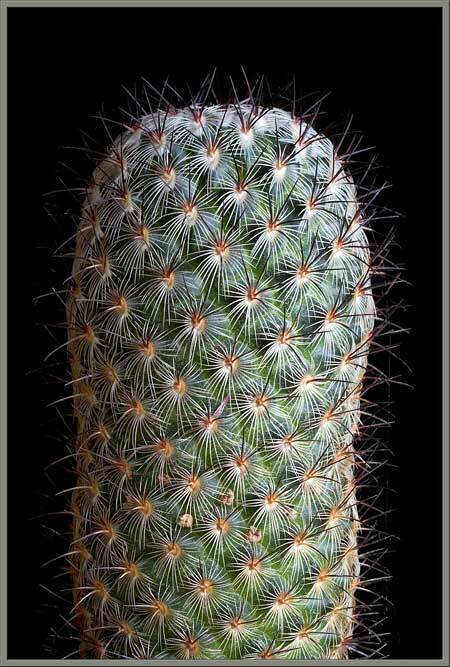 If you look carefully at the cactus shown below, it is evident that the shape is similar to the first one. There are differences, however. 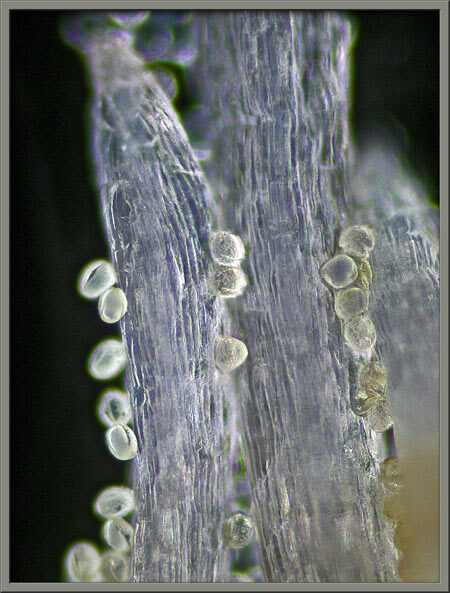 There are no mats of white fibers present around the top areoles as there were in the earlier plant. 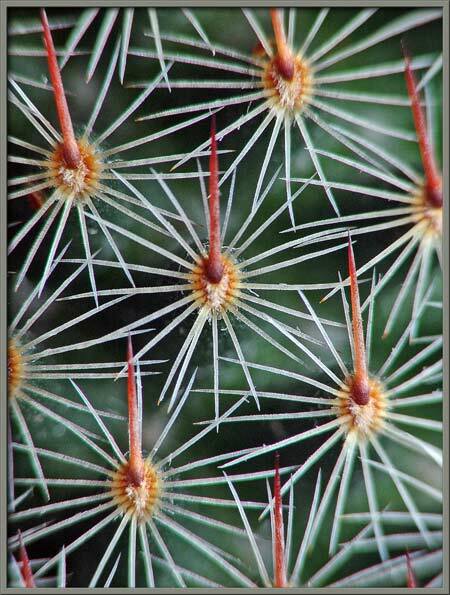 Although the radial group spines are similar, the central group consists of a single spine instead of the three or four spines seen earlier. Details of the spine arrangement can be seen more easily in the images that follow. The single central spine in this case is considerably shorter than any of the central spines in the first species. 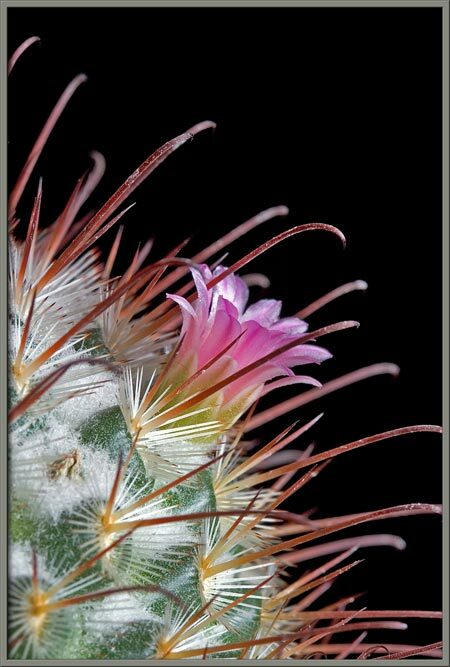 Notice that in this species the tips of both sepals and petals are more pointed, and less rounded than in the earlier one. Note the large number of shriveled dead petals that remain from earlier flowers. 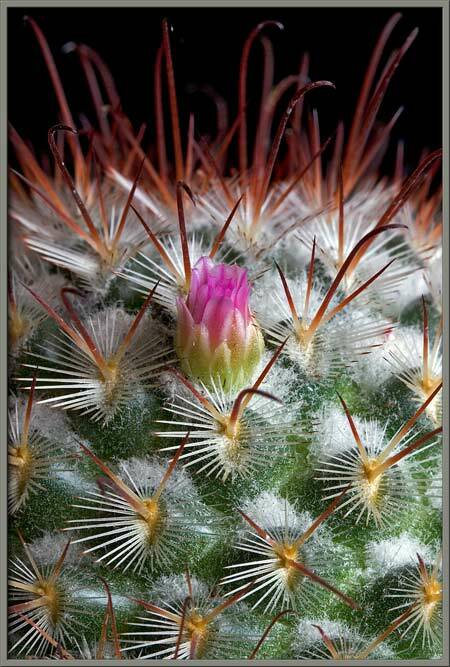 The blooming flowers, with their long tubular base extending to the centre of the areole, are striking. 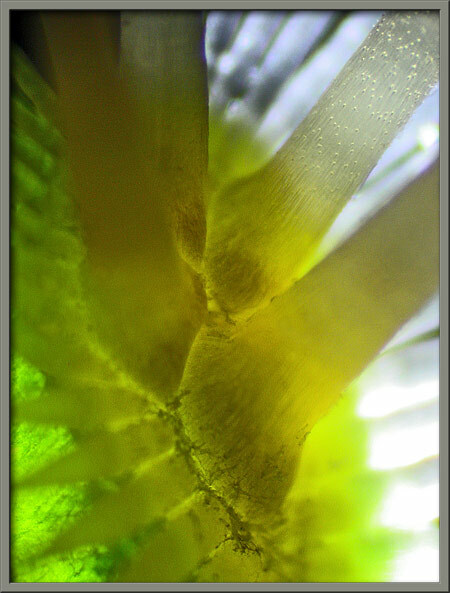 In this species, the stigmas (light green) extend out farther than the many yellow anthers. This may be an additional adaptation to decrease the possibility of self-fertilization. 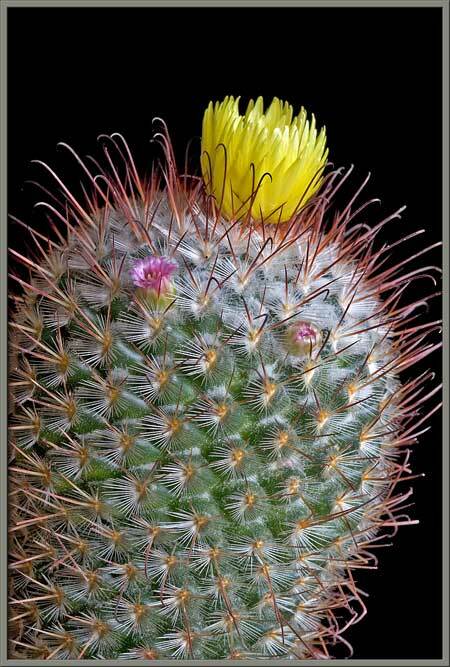 The last two cacti to be studied were not flowering, and so it is the spike arrangement of the areole that is of interest. Here, the plant’s overall shape is similar to the first two, although the length is greater. Careful study shows that most areoles have six central, identical, slightly curved spikes, while a few have only five spikes. Around and between the areoles there is a fine dusting of white fiber-like specks. 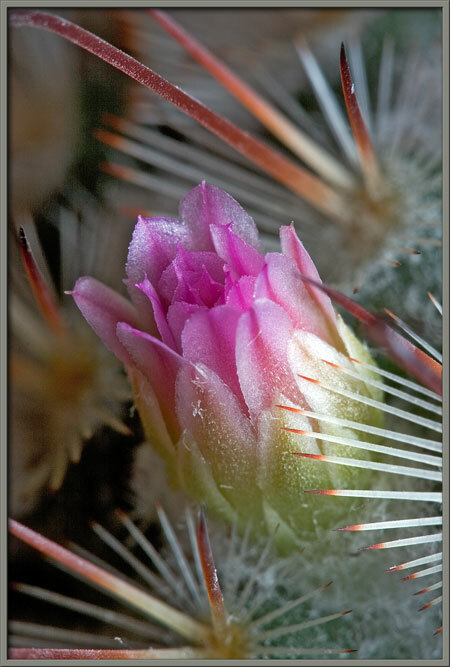 The view on the right below shows the six central spikes and the many radial spikes of a single areole. This species is markedly different from the first three studied. Here, the tubercle bumps occur in vertical parallel rows called ribs. 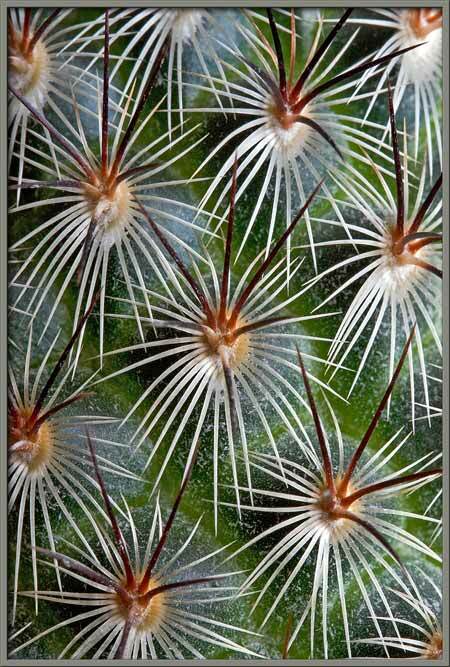 The longest spikes are about three centimetres in length and are viciously sharp and extremely strong. Each areole possesses a single woody central spike, and eight or nine woody radial spikes that point slightly up (and away) from the rib. 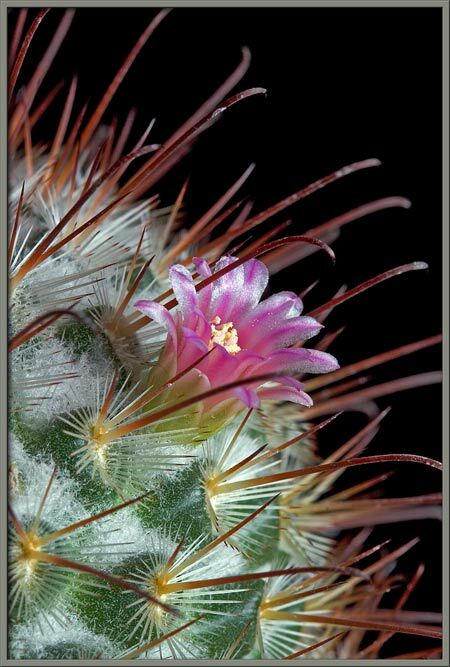 When I first got the idea to write this article about cacti, I certainly did not expect to be impressed by the plants. 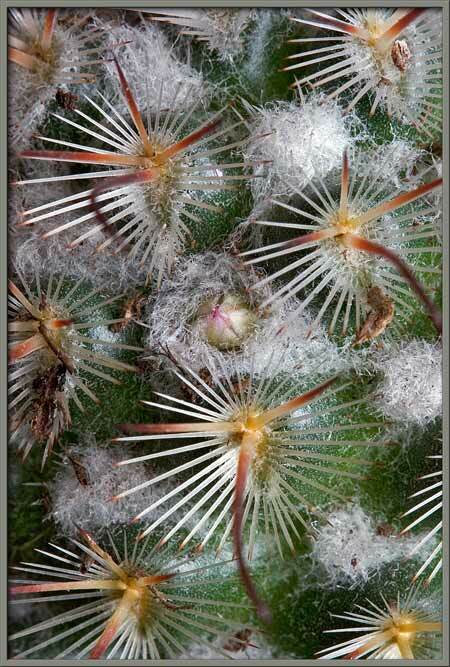 While taking the macro-photographs, it slowly dawned on me why these unique plants are so sought after and prized. 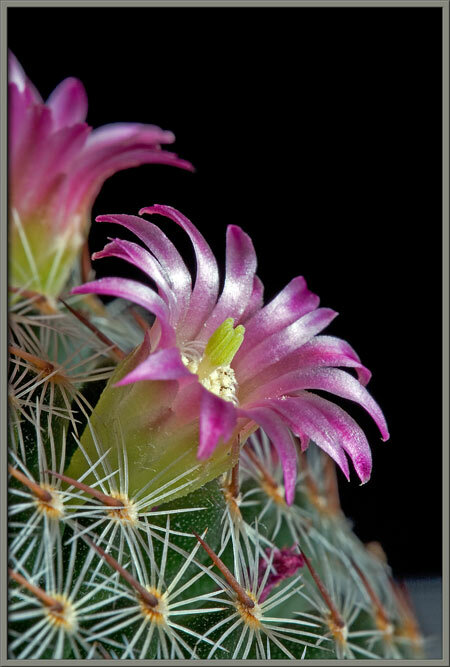 Their strange forms, intricate detail, and strikingly beautiful flowers can easily become addictive! 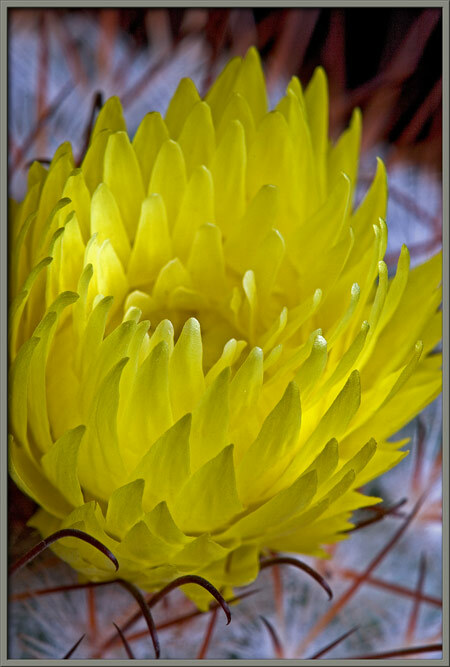 All of the macro-photographs were taken with an eight megapixel Canon 20D DSLR equipped with a Canon EF 100 mm f 2.8 Macro lens which focuses to 1:1. A Canon 250D achromatic close-up lens was used to obtain higher magnifications in several images. 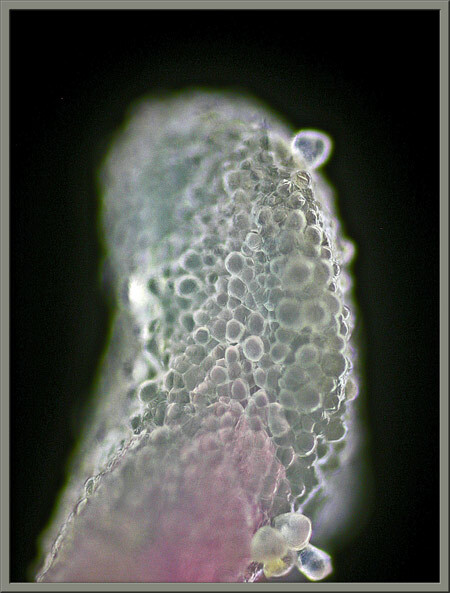 The photomicrographs were taken with a Leitz SM-Pol microscope (using dark ground and phase contrast condensers), and the Coolpix 4500. Published in the January 2007 edition of Micscape.